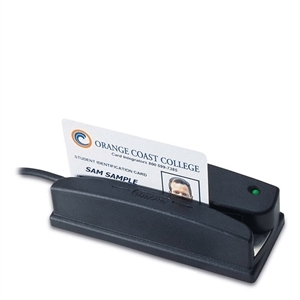 Omni Heavy Duty Slot Reader (Mag Reader, USB Interface, Tracks 1,2&3) The Omni Heavy Duty Slot Reader scans bar codes printed on paper card stock or plastic. An infrared option is available for security-based applications where bar codes are overprinted to prevent duplication. The Omni reads up to three tracks of information with a single swipe in either direction. In combination the same Omni unit can read both bar code and magnetic stripe media. TTL RS-232 keyboard wedge USB-Keyboard and Weigand interfaces are available. The Omni Reader is designed for demanding applications such as for access control or in self-service kiosks. Its die-cast metal base stainless steel wearplate and impact-resistant housing make it ideal for stand-alone high-volume traffic. Its metal base can be securely mounted with screws and cable exits are available at the side end or bottom of the unit.